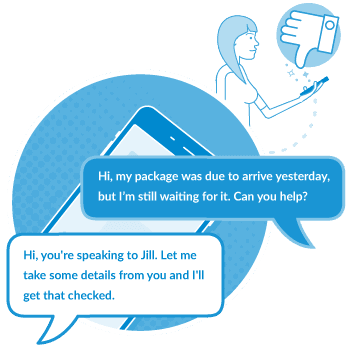 SMS Chat is a great way for your contact centres and customer service desks to enjoy fast, live two-way SMS conversations with customers. Our secure online portal makes it easy for agents to engage in a more effective way than making a single telephone call at a time. Dealing with customer complaints is made easy with SMS Chat. There's no need for unhappy customers to wait on hold for long periods, by sending a simple SMS with details of their complaint. This and multiple other requests can be handled quickly and efficiently by a single user. When a complaint has been received, it is routed directly to the right team and each user within the team can handle multiple conversations to resolve customer issues. 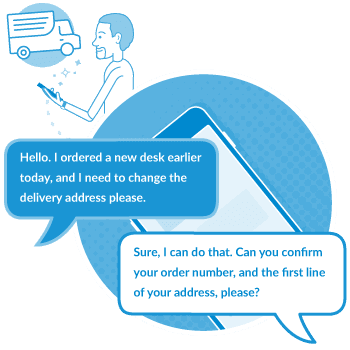 Our two-way SMS Chat platform also records all conversations, giving you full historical tracking, providing your business with the power to make customer service improvements. 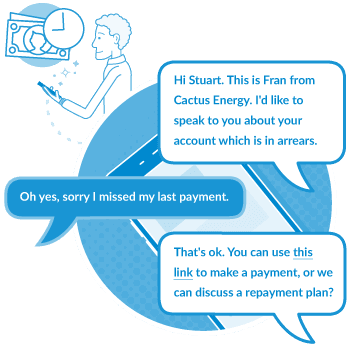 We'll use data supplied by you to contact customers through SMS who are due to make a payment, with an invitation to text back and start a two-way chat. The customer's identity can then be validated, and a payment plan agreed with the customer. A link to a Mobile Journey can also be included where a PCI compliant payment can be made. If required, a report with details of the conversation can also be supplied. 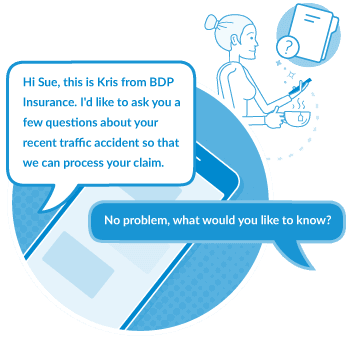 As well as being able to supply your customer with periodic SMS updates about the status of their claims, SMS Chat provides a facility where they can ask additional questions without having to make a call. After the identity of the claimant has been validated, the customer is free to ask any question to your agent. Details of the conversation can then be saved, and delivered to you as a report. When using SMS to confirm a customer's order (supplied through Esendex SMS), the customer is provided with a number to use if they wish to make an order alteration. The customer's response is directed to the service department with a copy of the original message, where the order alteration can be discussed and processed. A confirmation SMS is then sent to confirm the details of the revised order. By talking to your business through SMS, customers can arrange appointments for a time and date that suits them. They can then receive confirmation of that booking through SMS Chat, and even re-arrange a previously made appointment. SMS Chat helps to eliminate the need for your customers to call you to make an appointment. SMS Chat allows your agents to manage multiple bookings at the same time, rather than one at a time on the phone. 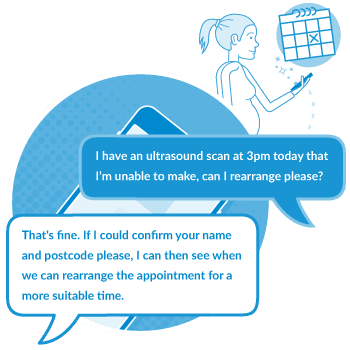 Anything from an engineer's visit to a doctors appointment can be handled quickly and easily using SMS Chat. Provide convenience to your customers at a time and place that suits them. SMS is available on every mobile phone, and doesn’t rely on web access, meaning more customer contact. Save money by allowing agents to manage multiple text conversations, rather than one phone call. Most consumers want to use SMS to speak with brands (bulldogreporter) meaning better customer experiences. Provide a better service by allowing agents to see previous conversations and respond more efficiently. Set up and use predefined message content, which allows your agents to respond more quickly. Smartwheel are a telematics insurance provider, who were looking for an easy way to prompt their policy holders to top up their policy by adding additional mileage. By engaging through SMS Chat, 25% of the recipients responded, and 29% of those went on to make payment, which far exceeded the results from previous email campaigns. What can SMS Chat do for my business? Here are the features which will help transform your business communications. Dedicated virtual mobile numbers for each of your departments. Use predefined message templates and free type messages - or both! Set up automatic message responses for when your business is closed. Be alerted to incoming messages without leaving the system you’re using. Automatically assign conversations to available agents. Allow customers to resume conversations with a specific agent, rather than the next available one. Automatically re-assign conversations, after a defined time period has elapsed. Archive all conversations for full traceability. Define roles, and set up your levels of user system access. After a user defined period of inactivity, conversations will be automatically closed. Want to see SMS Chat in action?